See? This is simple, but fun with no shouty shouty! Bike number 2: Kuwahara Laser in chrome with red crash pads and a red Aeroyal seat - hell yeah! 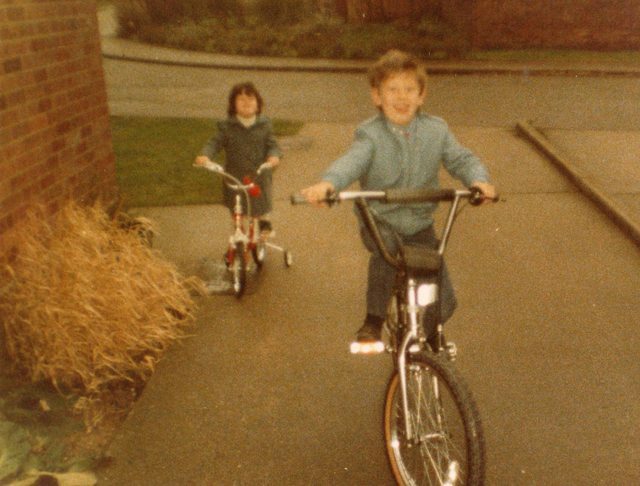 My first bike when I was 6 was some little fat tyred thing with lethally sharp short mudguards that sliced open my leg from knee to crotch. Bled all over my dads Beetle on way to medical centre. 2nd bike I remember but not what it was. 3rd bike was a German version of a chopper they sold in the NAAFI (my dad was stationed in Berlin). A Grandezza. Think it was xmas 1972 I got that. Had to leave it behind when moved back to UK a few years later. I learnt to pimp bikes at an early age! 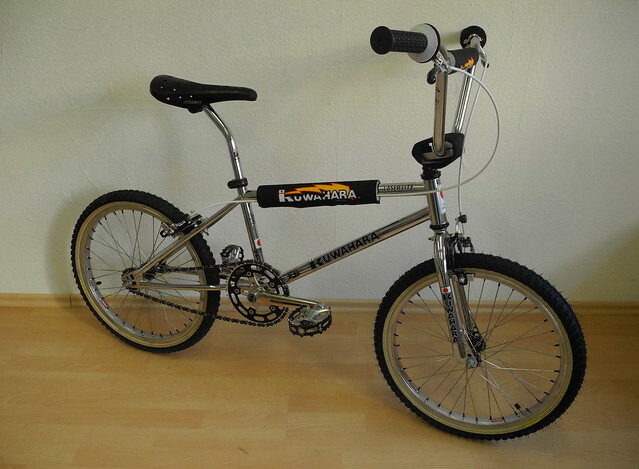 My first proper bike was a no-brand, Littlewoods catalogue quality all-chrome BMX. I cannot remember any detail about this bike it was that special. The only thing I did to it was added some Mongoose pads......which I think someone gave me. Second bike......probably catalogue again.....Townsend 2000 in Rhubarb and Custard colour scheme. Wondered for ages in recent years what model this bike was (memory a bit dim about such a mediocre bike) and it was only recently I saw one chained up locally and recognised it instantly......then found a pic of one online. Then things got serious......mid-teens and parents decided it was time for a proper bike, having seemingly trying to put me off cycling for life! 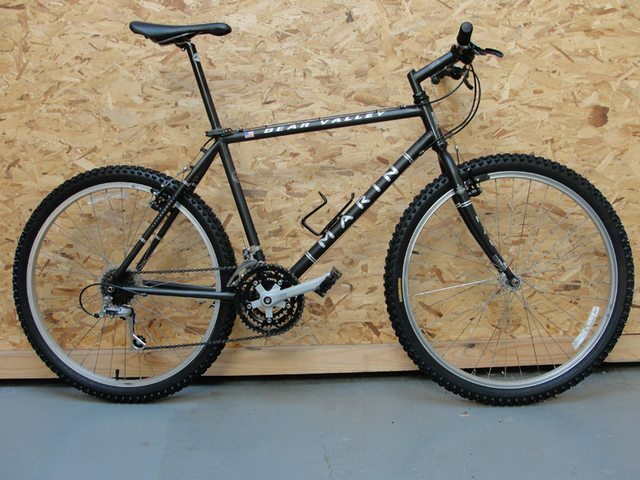 1993 Marin Bear Valley - bought secondhand from Madgetts Cycles in Diss. Absolutely loved that bike......rode miles on it. Was a first taste of independence - with friends we rode to other friends houses (who lived miles away), we rode to Snetterton to watch the racing......and we spent more time than I care to remember over the local scrub land, making our own trails. Bike got ridden into the ground and eventually damaged so scrapped.......I learnt to drive and the biking tailed off. Several years later I was reminiscing about my Bear Valley and came across this website - and ended up stumbling across one exactly like my old one at a car boot sale. £40 later and she was mine.....albeit a bit too small. Superb first photo.... this was what I was hoping for! So, our Jim has spotted this thread on his phone during lunch (I still find the access our kids have is truly bizarre! He gets sent his homework via Google chrome!!!!) anyway, he’s asked if he can have his bikes posted……. 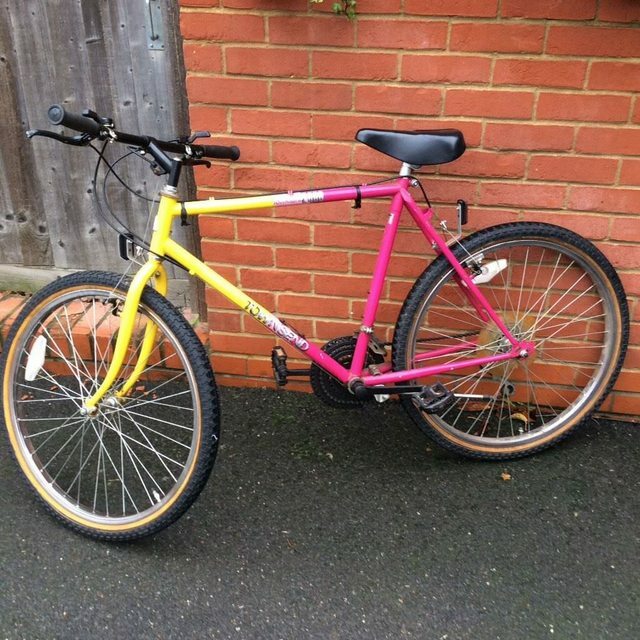 First pedal bike, from Halfords. This is his first day without stabilizers…pleased as punch he was too, I had to run after him to get him in for his tea! And finally, the finished article, his 1969 Claud Butler Electron Super Five, which is now rapidly being out grown! Not to worry, because he’s already spent (with his own money) £40 on a 1976 CB Cavalier tourer and £20 on a 1994 CB Oracle MTB. To be sorted this winter….. I almost had a big red Chopper but this roguish looking cove made off with it. 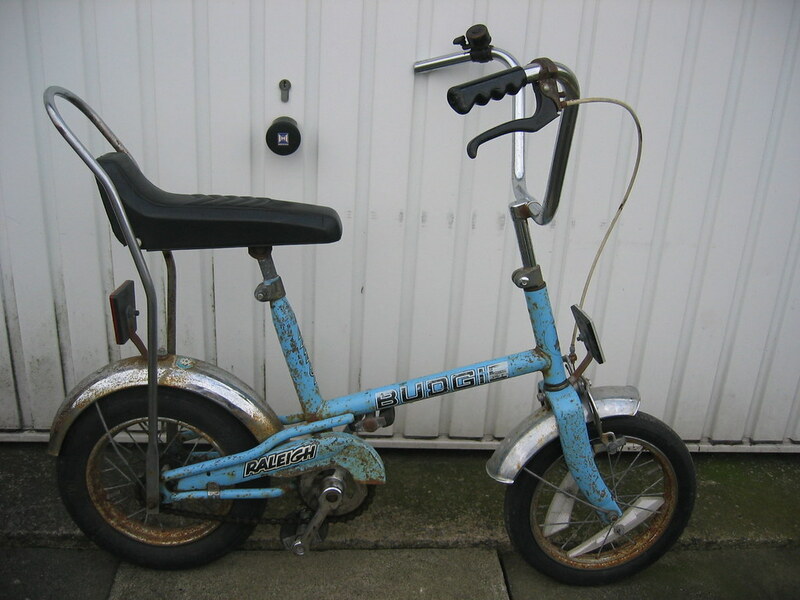 1st bike I remember which had the stabilisers off was some blue Raliegh with white tyres. 2nd bike an hand me down Puch. Had some weird cross-bar / top-tube going on. 3rd bike a Peugeot. Blue, chrome steel rims, obligatory Wienmans suicide brakes, Huret gears. Later on it had a custom paint job with any Airfix paint I could lay my hands on.